Adobe Photoshop is a graphics editing program developed and published by Adobe Systems Incorporated (from Wikipedia). This is my first post about photoshop in this blog. Even though I have many tutorials in mind about Photoshop I decided to write about shortcut keys used in photoshop. I am not going to explain all the Popular Photoshop shortcut keys. Still try to cover most that I can.I am referring Photoshop CS5. 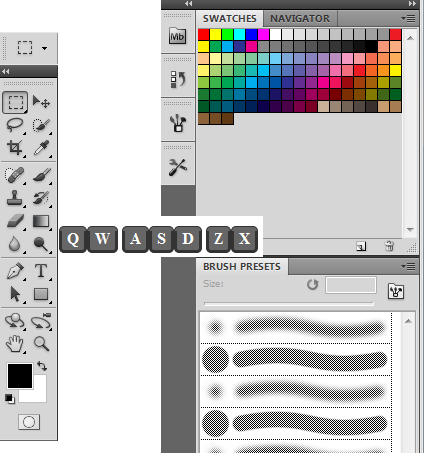 Photoshop CS5 is powered with some new features, mainly 3D effects and many more. Previously I was using mouse for all my editing and designing. When I learned some important shortcut keys, I just wondered it is very easy to develop better images in short span of time. If you want to use Phtoshop faster? Then learn shortcut keys. Ctrl+o-Path for opening an existing image file.